The granddaddy of all stealth action games. 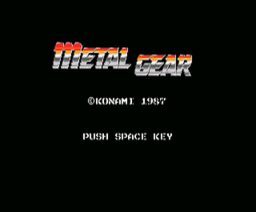 Metal Gear (this version anyway) is what Hideo Kojima had in mind with the series. The graphics are great in comparison to the NES version, and this has more bosses, a bit more dialogue, and is generally more fun to play. 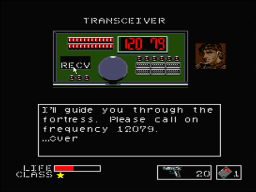 Well, the game is finished, and you -can- see a difference between the original version and this translation. Unfortunately, there seem to be a few context errors… spelling and such. It’s not too much of a problem. The new text really helps make sense out of the story (which was barely there to begin with). 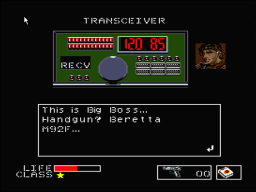 There are two patches: One keeps the original game’s Engrish used in some weapon names, and the other corrects these errors. 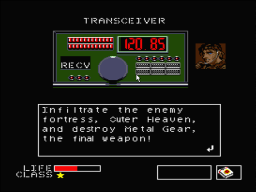 Also, do NOT use the Metal Gear rom that is recognized as such by Cowering’s GoodMSX. According to the readme, this is a bad dump. So you’re supposed to use another version, but who knows which one.